Broadstone Music Series are excited to announce our first summer festival. Featuring some of our favourite artists from the last 10 years of the Broadstone Music Series! United Reformed Church Hall, 3pm. learn arrangements of classics & musicals. Tickets £15, advance booking essential. 7th July: Dorchester Piano Quartet. Strauss recital, talk & cream tea. 8th July: Capriccioso String Quartet. St John’s Church, 7:30pm. Italian themed music & wine. 9th July: Recitals for Wrigglers. St John’s Church Hall, 1.30pm. Click here for more details. As seen at the Edinburgh Festival. For ages 0 to 5 years. Sponsored by Lemur Landings. Tickets £5 child, parent free. 9th July: Folk Delights & Dinner. The Cargo Lounge, Dunyeats Rd, 7pm. Tuneful Tales with Tim Laycock & Alastair Simpson. Poetry by Thomas Hardy & William Barnes. 10th July: Music for Life. St John’s Church Hall, 11.30am & 2pm. Tunes from the Hollywood Golden Age. For seniors, with Jennifer Curiel & Kevin Pritchard. 10th July: Recital by Young Local Stars. Recital by some of the brightest stars from the Royal Colleges of Music. Brahms & Bridge and beyond. 13th July: COME & SING. St John’s Church, 10am. Participation event for final festival concert. Camerata Musicale with Hurn Court Opera, Vaughan Williams Serenade to Music, & more. Cream tea in interval. As part of our Summer Festival, Broadstone Music Series is planning to hold a playing day for adult amateur orchestral musicians. The aim is to provide tuition and coaching on simple orchestral repertoire in a supportive environment for players of grade 3 standard and upwards. 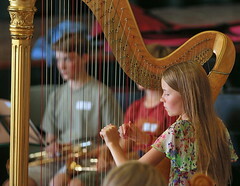 The proposed playing day is scheduled to take place on 6th July 2019, 10.00 – 15.30 (with a play through at the end of the day) at the United Reformed Church in Broadstone. Tutors will include local professional orchestra musicians and the day will be structured with sectionals in the morning and full orchestra in the afternoon. Cost would be around £15 per person. We are currently trying to gauge if there is enough interest to run the above playing day. If you think this is an event that you might be interested in, please express your interest by sending your name, instrument and email address to Emily Livesey emily.c.richards@gmail.com before the end of March 2019. Flute and Clarinet Music Ensemble Fun! We are delighted to welcome 2018 Wigmore Hall String Quartet Competition competitors to Broadstone for their first appearance in the Broadstone Music Series. Find out more about this fabulous string quartet ahead of the concert. Due to unforseen circumstances, the original programme has had to change. Mark Derudder and Miguel Angel Rodriguez Olivera will be joined by guest principal musicians from Bournemouth Symphony Orchestra. Alongside Jesper Svedberg, Auriol Evans, Tom Beer and Joan Martinez, and they will present a special programme for us. The group have performed chamber music together to much acclaim, so we welcome them to Broadstone this spring! Schubert String Quintet in C major. Brahms Sextet no 1 in B flat major. This recital is a pre-performance to Idomeneo’s residency in the Benjamin Britten Festival which begins on 8th April. As ever, musical education is a key part of this programme and six local, young musicians are receiving coaching on the Brahms sextet for a future performance. Interval tea and fresh cakes included! We anticipate that this concert will be very popular so advise you to book early to avoid disappointment. Tickets can be booked online, via Hintons in Broadstone or by phoning 01202 695773. Something new for Broadstone Music – Concert and Dining experience! We are pleased to announce that we have paired up with The Cargo Lounge in Broadstone (situated just across the road from St John’s Church) to offer a post-concert dining experience. This will be served just after 6pm on Sunday 7th April, straight after the Idomeneo and Friends concert where there will be an opportunity to meet the musicians too. This wonderful restaurant have agreed to prepare a special roast dinner especially for just 20 members of our audience at a special rate for us, and the menu choices are below. We recommend booking as early as possible to avoid disappointment! Roast dinner with roast potatoes, sage and onion stuffing, Yorkshire pudding and mixed vegetables. If you would like to book this dinner then please do so directly with The Cargo Lounge via their website or by phoning them on 01202 694343. The piano can be a lonely instrument, so come and learn new skills while exploring repertoire in piano duets, trios and quartets! Music available in advance to prepare. Led by distinguished concert pianist Béla Hartman alongside his wife Julia, with other supporting highly regarded supporting tutors, this very exciting and fun day will be inspiring and an enrichment in piano skills for all involved. Parents are welcome to hear the informal performance at the end of the day! Led by Fiona Mclean-Buechel (Head of Junior String department at Trinity Laban London). Various string ensemble group coaching throughout the day with a teachnique class included at all levels! Ending with a final performance. Supporting tutors include invited string players from Bournemouth Symphony orchestra. Enquire through website for details and application form. Led by renowned trumpeter Neil Thomas, a day of fun and informative brass workshops alongside visiting talented young brass players from Kingston Music Service. Supporting tutors invited from BSO brass section. Once you have applied and paid, detailed information about the workshop days will be sent to you nearer the time. Please fill out the below form if you are interested in any of the above workshops. St John’s Church, Macaulay Road. We are very excited to present our Charity Fundraising Quiz Night. Think you could put together a team for University Challenge? Mastermind? or perhaps you just want to enjoy an evening with plenty of fun and laughter. Come along and enjoy the challenge. Teams of up to 6 people, tickets £10 include a ploughman’s supper. Bring your own drinks and glasses.